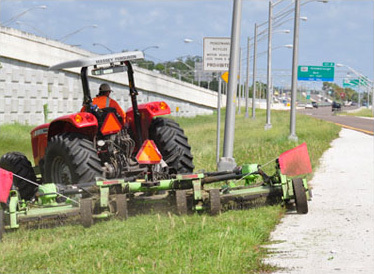 JSM Services, Inc. has been performing FDOT mowing since its inception in 1995. We have a highly skilled staff that is well versed in working with the motoring public. Some of which have worked with JSM for over 30 years. The level of workmanship and integrity that we hold ourselves to is second to none. At JSM, SAFETY is our number one goal on all FDOT and municipal right-of-way projects. We use safety as a standard of judging ourselves and the standard of work we provide. The safety program we adhere to is one that we have used now for over two decades. We hold weekly safety and incident meetings, daily vehicle and equipment compliance checks and many other safety related activities that make our company a safe and secure place to work - not only for our employees, but also for the general public. We do not allow our equipment to operate on the jobsite unless it is in proper working condition with all the proper safety requirements in place. As times have changed and FDOT has been awarding more and more contracts to Total Asset Management companies, JSM has evolved to meet those needs of the TAM companies. We have worked with TAMs since the first contract was awarded for I-75 in Florida and have continued to do so for well over a decade.